With every new batch of Sing Sing releases we keep finding ourselves saying “Thank God.” This time they’ve gone and reissued the Belgian classic Jet Staxx single, a single from Dwarf, and an LP from The Pumphouse Gang. All of which are well-worth your time and money. Jet Staxx was the solo project of Mike Butcher, a studio technician who worked in London and Brussels who also lent his playing abilities to Elton Motello. 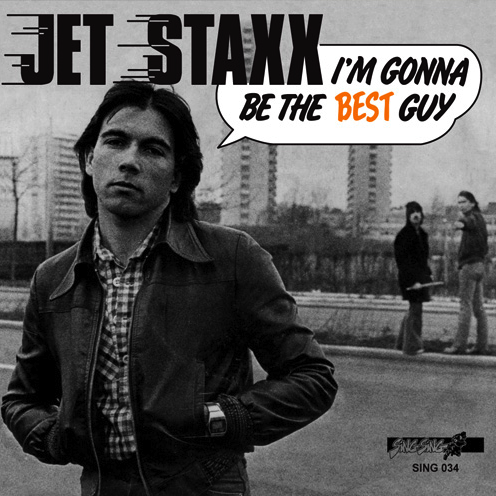 He released two singles under the Jet Staxx moniker, the “I’m Gonna Be The Best Guy” single being the first – originally released in the Spring of 1978 through Topkapi in Belgium. The two-song 45 is a total ripper. You can check out the A-side below. It’s got a sort of pummeling DEVO-vibe to it. The Dwarf single that SS reissued we knew pretty much nothing about going into it. Apparently it’s just one of the many singles lost to obscurity — but Sing Sing has us covered so we won’t miss out on this jam from a bunch of 15 year-olds [seriously] The Pumphouse Gang [formed after the breakup of Horse] frequented around the Ryde and Isle of Wright parts of London in the later part of the 70s. They released a handful of singles for Splash Records and this LP has the best of them — including 8 tracks that have never seen proper vinyl treatment. We could go on and on trying to learn you about Pumphouse Gang — but you’d be better off just snagging the LP and then heading here to read up on them. Get yourself over to SingSing and snag ’em.